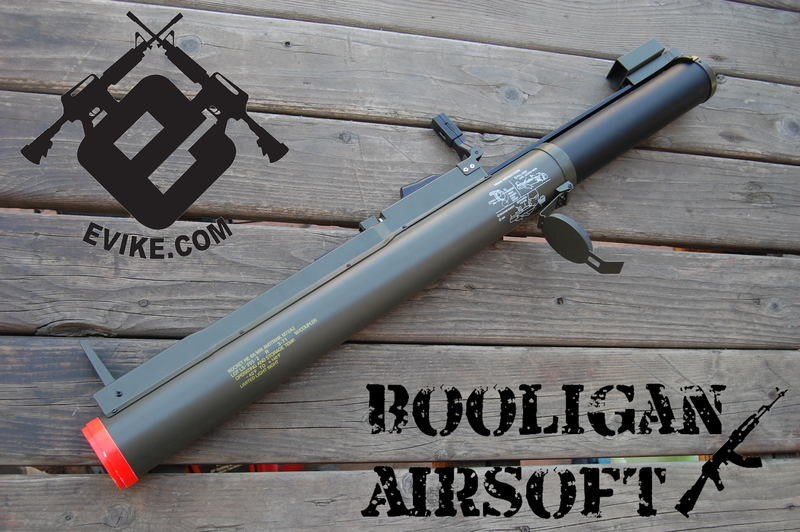 To say that I love large bore airsoft replicas is a gross understatement. Seriously, if it's gas powered and I can launch a big foam round out of it, I'm a happy camper. So, when Evike started carrying the Avengers M72 LAW, there was no way I was taking no for an answer. Oh yes, it would be mine. And now it is! Let's dive into this thumper and see how she works! As mentioned before, I obtained this launcher from Evike, who has it available HERE, priced at $169.99 at the time of this review. It does not include a shell to power it, so you will need to order one before you will be able to use it. It seems to be compatible with pretty much any of the shells in my collection, so pick whichever one fits your budget and performance goals. The launcher was shipped out a day after ordering, arriving 2 days later using UPS Ground. The Avengers M72 is a clone of the old Deep Fire launcher, featuring a polymer main outer tube with a metal inner barrel system and steel firing mechanism cover. The thing is, to put it mildly, solid. It extends and opens up just like the real LAW with the back sliding out allowing the iron sights to pop up. It is powered by a single 40mm shell and has a 57mm barrel giving you a few options for projectiles. It has one of the more laborious reloading procedures of any launcher that I've tested out, and I'll go over that in full later on in this review. The packaging for the LAW is very unassuming, consisting of a simple cardboard box with a small plastic handle for easy carrying. There aren't any real labels to speak of; Avengers clearly didn't spend much on the packaging budget. Along with the launcher itself, Avengers included, um, nothing. Well, they did include a funky little sling system that requires you to remove the orange tip to properly use, but other than that, nada. Like I said before, you'll need to pick up your own shell and projectiles before you can use the launcher, so factor those into your investment. The Avengers LAW is made of a variety of materials including metal for the internal structure, steel for the ridge on the back of the tube that holds the iron sights and firing mechanism, and a polymer material for the main outer tubes. It's a very solid setup with no major loose points or rattles. The launcher is comprised of a few main parts, the outer Olive Drab tube, the extendable black tube, and the metal inner tube which is a bright gold color. When you fire the launcher, you must first extend the black tube from the OD tube, adding about a foot to the launcher's length. When you do this, the iron sights flip up, and the launcher is basically ready to shoot. The controls are quite simple, consisting of a safety lever that slides out of the body, and a large rubber covered trigger lever. Pull the safety out, aim, and push the rubber button to fire. One thing to note, that safety slides all the way out, so don't lose it! Aiming the LAW is a simple affair, just use the rear peep sight aligned with the front leaf sight depending on the range of your target. When you collapse the launcher, you'll need to push down the iron sights underneath the little door that covers them to collapse it fully. Tuck the front sight away first, then the rear. On the side of the main tube, you'll find markings indicating the proper firing procedure, as well as some markings indicating the type of launcher, operating temps, etc. Not at all indicative of the airsoft version's specs, but a nice touch that adds to the realism. The LAW doesn't use magazines, instead being fed a single gas filled 40mm round at a time. This is as good a section as any to discuss the proper loading and firing procedure, so stay with me during this somewhat complicated process. First and foremost, you need to load your 40mm round and whatever projectile you want to shoot out of it. With the launcher collapsed, drop the end cap by pulling out the pin and flipping it down. You can then look inside the rear of the launcher, grab the silver rod and rotate it slightly to the left. This will unlock the inner barrel, allowing it to slide out the rear of the main tube. Slide it out until you can access the little black latch and open the breach. Once it's opened up, you can insert your desired projectile (more on that in a bit) and the shell of your choice. It seems to be quite open to the shells that it uses, as all of my shells (Madbull, King Arms, S-Thunder, various ACM shells, etc) fit and fired just fine. Once the shell is inserted, close the breach and slide the inner structure back into the main tube, rotating it slightly to the right once it's inserted fully to lock it into place. The launcher is now hot, and you can put the base cap back on for storage to carry onto the field, if so desired. When you're ready to actually launch this thing, you pull that pin and flip the base down and slide the black tube out of the main olive drab tube. This will allow the iron sights to flip up and will align the trigger unit with the firing tube. Before firing, slide the safety towards the front, aim, and fire by pressing down the large black rubber covered button. Depending on your shell, this might take a lot of pressure before it fires. Now, what are you going to shoot out of this? That will largely depend on your performance goals. You can certainly load the shell up with BBs and just fire out a cloud of BBs if you would like, but that's kind of a waste. The launcher has a 57mm inner bore which, in my experience, is just too big for the 40mm power source. You can fit a small nerf football or foam Milsim Labs round in there, but your performance won't be that great. Expect 75' or so out of a large foam round, like I said, not great. In order to get optimum performance, I would recommend reducing the bore down to 1.5", giving you a much broader range of projectiles and much better performance. In order to do this, you'll need some PVC pipe, couplers, tape, and a hacksaw. With the barrel brought down to 1.5" bore, feeding it Milsim Labs M29 rounds, I saw a range increase out to 200' vehicle accurate fire, a massive increase from the 75' or so I could muster out of the 57mm bore. I'll be testing this out with PMOG chalk filled 40mm rounds as well and will report on those results! There's really not much to speak of with the internals. When you open the launcher, it aligns the rubber firing trigger with the inner trigger on the metal barrel, allowing the launcher to fire. When you push the button, it extends a small rod onto the back of the chamber, pushing the firing button on the back of the shell. As far as modifications go, you'll certainly want to do the 1.5" bore conversion pretty much as soon as you get it. Honestly, the performance is so much better with the smaller bore, it just makes sense to do it. Other than that, there's really nothing else that you can, or need to do with the launcher. If you're in the market for a launcher to fit many loadouts from Vietnam all the way to the modern day, the Avengers M72 LAW is an inexpensive and well made option. The loading procedure is a bit of a pain, and the performance out of the box is lacking, but you can easily modify it to get 200' usable range for just a few dollars and some elbow grease. The LAW has a lot of potential, and thankfully, the relatively low purchase price compared to the other options on the market make it easy to justify picking one up, tweaking it a bit, and hitting the field with a great anti-vehicle replica. how do you re-size the bore?